We also stress safety. Our team is more likely to suggest less things to do in order to take care of you and to look out for your best interest. Learn what sets us apart and visit our website and Discover our Beauty Theory Advantage. Thanks for Reading. I look forward to posting more very soon. We have a unique approach to Acne Scar Treatment called the Acne Scar Vitalizer Treatment. It is a multilayered approach to acne scarring which is a multilayered disease process. The hair follicle extends deeply into the skin. Hence you have to treat all the layers to reverse the scar to the best that you are capable. It involves lasering the surface and stimulating the deeper layers to rise from being a depressed scar. It is based on surgical experience of over 15 years after Dr. Young graduated from medical school in 1999. Question 1. What are the chances of the fat grafting transfer leaving uneven lumps on patient’s face based on your experience? Answer: This is pretty rare. It comprises about 30% of our practice or more and we get this about 1-2% if that. It is due to our process of placing fat. We use very small amounts with each passing. For example a cc of fat we will go back and forth with the cannula about 10-20 times. Question 2. Do you centrifuged/purified the harvested fat cells prior to injecting into the face? I understand this is the standard approach to isolated whole and undamaged fat cells for transfer. Answer: We have tested different speeds and have found the best speed for survival. We have done many different approaches. The standard 3000 rpm, letting the fat sit to separate, harvesting all at once versus staggered, using different cannulas.Based on this we have come up with the best ways to get the best survival. Question 3. Previously, I had tummy tuck/lipo around torso/abdomen about 7 years ago. I’ve been told that fat cells do not grow back. If the patient gains weight, then the remaining fat cells will grow bigger. Is this true? If so, will the fat cells harvested from my sides/hips be optimal for injection into the face? More importantly, any concerns about scar cells being harvested? Answer: I don’t typically prefer fat from sites that have had liposuctioning unless those are the only areas left. Question 4. What method/tools do you use to collect undamaged and healthy fat cells? use very low suction liposuction? use small gauge hypodermic needle or special cannula? Answer: I use small 10cc syringes with hand pressure. Answer: This depends. You’ll always look better than a twin that didn’t get it done. Question 6. As a matter of comparison, which procedure do you as a surgeon find easier to perform? Asian Blespharoplasty vs. Facial Fat Transfer? Answer: Fat transfer for sure. Question 7. Also, which procedure do you see your patients recover easier/faster from? Asian Belspharoplasty vs. Facial Fat Transfer? Answer: This depends on extent of fat transfer and the area. Question 8. In your experience, what are patients biggest complaint post-op? bruising? swelling? On average, when do most of the bruising/swelling subside by? Answer: I would say probably bruising and swelling. Most of it goes away at 1 week. However everybody’s perceptions are different. Answer: you can always reduce the fat. This is rare. Most people want more fat and the biggest risk is less fat survival. I want to look refreshed and natural with the procedure. These two goals are super important to me. Thanks! . okay!! I’m here in Korea right now studying more on Facial Contouring. I’ve been doing contouring in some manner for 6 years here in Bellevue. I have been in Seattle for 3 years before that working on Facial Aesthetic Surgery in other ways. Prior to that I was working in Trauma surgery at Santa Rosa Medical Center and then for another 6 years doing facial contouring with facial trauma at Louisiana Shreveport and Los Angeles at the University of Southern of California. The above picture is a result from one of the clinics | offices I visited in Seoul Korea. This is an amazing result. She looks completely different and much prettier. She underwent bijaw or 2 jaw surgery to impact her upper jaw and reduce the distance from her nose to her lip and show less teeth from the top or upper teeth dentition | maxilla. She also went through jaw angle and cheek contouring with shaping of the chin as well called Genioplasty. In Korea, I saw about 8 cheek contouring surgeries, 9 jaw angle contouring, and 11 genioplasties. They really do alot of facial contouring surgery. They have people from all over the world come see them. I saw people from Russia, China, Thailand, Vietnam, etc. We are currently staying in The Gangnam District. This district (Hangul: 강남구; hanja: 江南區; RR: Gangnam-gu) is one of the 25 gu (local government districts) which make up the city of Seoul, South Korea. Gangnam [kaŋnam] literally means “South of the (Han) River”. Apparently, The Greater Gangnam real estate make up 10% of the land value of the entire country. This area has been known as the Beverly Hills of Korea. Apartment values are average about 950 per square feet. New York Cities average is 1454. I’m here specifically to see more facial contouring procedures made popular by the Korean Plastic Surgeons. Malar | Cheek contouring involves the movement of the cheek bone more inward to make the cheeks look smaller and more feminine. Jaw contouring involves making the jaws more slender and less masculine. We will update this blog with more pictures soon. There are very interesting differences between South Korea and America. Apparently, people tend to work 6 days out of the week. They recently past a law that workers can only work 5 days a week. Kids typically go to school from the 7-9 in the morning until 9 at night. After school, kids go to an academy for more learning until 9 at night. Academics is paramount here. Koreans are very friendly here and we are having a great time. Today is Saturday and we are headed to a seafood walking tour. I’m going to try to be brave and have a live squid, meaning it will be still moving as I eat it! Thanks for visiting our blog by Seattle Rhinoplasty Expert Dr. Philip Young. We are here to talk about our Rhinoplasty Procedure and how we concentrate on you. Rhinoplasty is a very complex procedure. It is said that it is the hardest procedure, by far, for a plastic surgeon to master. The intricate Rhinoplasty Anatomy contributes to this dilemma because the nose is composed of the hardest tissue in the body, bone and some of the softest, most delicate and sensitive structures found in the nasal cartilages. Rhinoplasty is complicated also because of the 3 dimensional aspect and when this plays apart, shadowing and highlights can be a deceiving part of this understanding. Our Goal is understanding. We want to understand all of your thoughts, preferences, and desires regarding your Rhinoplasty Procedure and the subsequent beautiful results. We want great results for you based on your goals and not ours. Your little journey starts with your consultation. We like to get to know you as much as possible. Our mission is here: “We are facial plastic surgery experts who set ourselves apart with our passion to improve facial rejuvenation to get the best and most natural results through the fusion of traditional thoughts with innovation and thinking outside of the box. Our mission is to put all of our love into the procedures we do and take care of people as if they were our closest friends and family. We want to deliver unwavering quality care to improve people’s lives through Facial Plastic Surgery and the YoungVitalizer.” So part of of our goal is to get to know You as a person. From there, we will then take pictures of your front and side views so we can then morph them on a computer to see what you like. We feel the Rhinoplasty surgeon should be able to do this to fully understand your thoughts from a visual aspect. After all, Rhinoplasty is going to be a very visual result! Although getting the exact results from your morphed pictures is not magic, we pride ourselves in getting very, very close to those morphed pictures. We bring those photos in to the procedure room and we try like obsessed people to achieve those results. We know that’s what you want and we want happy people. Essentially we repeat that first consultation process 2 more times at least: 1.) at your pre procedure appointment; 2.) and at your procedure appointment when we spend 1/2 -1 hour discussing your desires and preferences so that we can know what to do during your procedure when you can’t express yourself. So we want to be your advocate during that time. 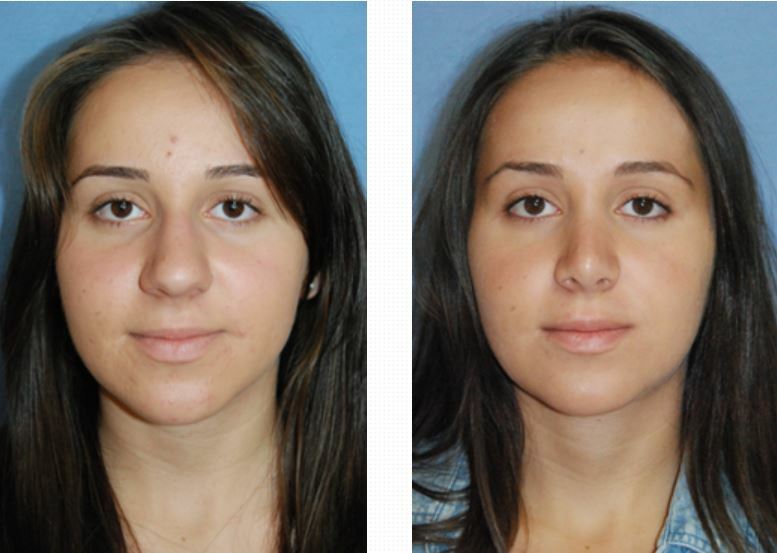 You can visit our Rhinoplasty Before and After Page to see more results!